As the impact investing community processes the shuttering of ImpactUS, it’s time to acknowledge a painful reality: when it comes to building the definitive impact investment platform, we’ve dug too many graves. In the world of online marketplaces and platforms, system design is the equivalent of “location, location, location” in the real estate world. In order to move the proverbial needle, you need other platforms and other networks to align with yours. The same big picture thinking that guides impact investments must apply to the platforms that facilitate them: terms like ‘competitor’ and ‘collaborator’ have fuzzier lines — and definitions — than we think. Too many platform builders approach their work in the uber-competitive, land-grab spirit of Silicon Valley, and then invoke the collaborative spirit of our industry to essentially convert your network into my commodity. It just won’t work. Launches that announce themselves as “The first marketplace…” or “The first network…” or “The first platform…” to connect impact capital with deal flow, are simply exhausting. It’s sad to know that they are actually not the first, sadder still to know they won’t be the last. 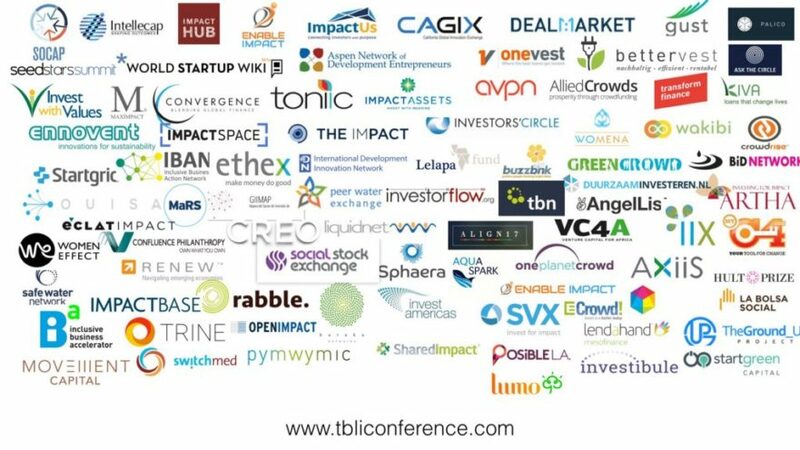 At any given time, there are roughly 150 such impact investing platforms, helpfully compiled in the slide above by Audrey Selian and Robert Rubinstein of TBLI. Sharing that knowledge has been frustrating. We have tweeted as nicely as we could to those making their announcements of ‘novel’ platforms. We have spent countless hours with peers planning to take the plunge, hoping to save them considerable effort and money by adopting a different approach towards the same vision. We have tried religion, hearkening to Ecclesiastes 1:9, “It has all been done before; there is nothing new under the sun.” For the artists among us, we’ve pointed to Salvador Dali: “Those who do not want to imitate anything, produce nothing”. We have even joked about performing Madonna’s “Like a Virgin” as an anthem to our mission, every time another breathless announcement hits our inboxes that for the very first time, Platform so-and-so will unify the social capital market. Jokes aside, it has been a difficult road for the impact sector writ large when being seen as the one doing it is more important than getting it done, and “owning the narrative” becomes more important than creating outcomes. The solution is not to throw more money at this problem of scale and cooperation. This is not a matter of just having ‘more investors’ lined up. Our remedy, which we have been promoting in the name of social data liquidity at SOCAP since 2015, is to break the silos and connect the pipelines using machine learning, APIs, and distributed ledgers. We will shortly publish a white paper that outlines the architecture for a global, distributed, modular, democratic infrastructure for mobilizing data, innovations, and capital. We are building this collaboratively, one use case at a time. By way of putting these principles into motion, and walking the talk of collaborative platform design, last year we worked with Conveners.org and ImpactSpace (ImpactAlpha’s open database) to release a widget that makes the selection of accelerator programs easy for social entrepreneurs, reducing their search costs and delivering better qualified applicants to accelerator programs. It is embedded on some 20 partnering websites. We are currently working to design and build a prototype of a market network that connects people, innovations and capital for SDG No. 6 (Water & Sanitation), tying together Artha Network, ImpactSpace, Sphaera and others to serve up investor ready deals that anyone can access on whatever website embeds the widget. We do all this not because collaboration feels good, or is the right thing to do — although it does and it is. We do this because it just plain makes business sense. If we can combine our deal and investor pipelines, we increase the value all of us provide to our customers. If we increase the flow of data, we can measure and aggregate impact in ways that gets us to the desired outcomes in whatever sector or geography more quickly. We are constantly looking for more tech enabled platforms (actual or aspirational) to join us in this collaboration. We conclude our requiem on a hopeful note: that American philanthropists will step back and more responsibly accept their role in these implosions. This is not only an opportunity for learning; it is an opportunity for action that supports smart system design, leveraging the power of decentralization and collaboration in an era of distributed computing and citizen centered design. Ignoring this in favor of picking the best branded horse will not only do a disservice to those of us who are practicing collaboration in word and action; it will also be the surest way for the world of development finance, venture philanthropy and impact investing to miss the 2030 window around the Sustainable Development Goals. The stakes are higher than they appear: this isn’t just a story about the failure of a few investment platforms, but about the failure to marshal the enormous resources needed to ensure a decent future for us all. Correction 19 February 2018: The source information for the image at the top of the article was inadvertently ommitted when the article was published last week. The image can be found here, in an entry dated 27 May 2017. Addition: Sphaera and Artha Networks were recently commissioned by the Bertelsmann Foundation to survey, analyse and report on the challenges and opportunities for platform operators in the impact finance ecosystem. Read the overview and download the report here. Astrid Scholz is a recovering non-profit executive turned tech entrepreneur and the Chief Everything Officer (CEO) of Sphaera — a firm designing and developing legal, financial and technical infrastructure that supports connecting, collaborating and sharing resources across disparate organisations, networks and communities. Audrey Selian serves as director of the Artha Initiative associated with Rianta Capital Zurich, an impact investing portfolio tied to an investment advisory to a private trust. She has been active in the impact investment sector since 2006. Artha is focused on social investment in rural enterprise in India, with a concentration on the agriculture, livelihoods and small-scale renewable energy sectors. Audrey is co-founder of Artha Networks Inc., an online impact investment tool originally designed to tackle the economics of due diligence around high impact, small scale SME opportunities in emerging markets. Jeff Tuller has over two decades of experience in finance and technology, and sees enormous opportunity at their cross section. After several years at “classic” capital firms like Bear Stearns and State Street Bank, Jeff officially converted to social capitalism at the very first SOCAP conference in 2008. He was Chief Technology Officer at Mission Markets, and most recently joined a small group of investors to acquire SOCAP, where he is helping to spread the Social Capital gospel.